All skill levels welcome- even beginner! 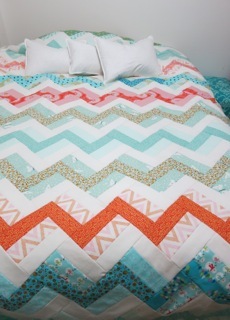 Make a simple triple rail block with a twist; a twist that puts the block on-point giving the quilt a zig-zag pattern that runs across the width. We’ll talk about fabric choices and learn, or review, how to place blocks on-point including the math formula for insert and corner triangles. As always, short cuts, variations and accuracy tips will be offered. If you can sew, bring along your cotton stash, your sewing machine and make something fabulous! A light lunch is included in the fee.